1. Only 60 slots will be allotted per session to ensure learning effectiveness. 2. Any change in the schedule of the learning session will be posted on the NWPC website. Pre-registered participants will be notified individually of any change in the schedule. 3. A registration fee of P500.00 (inclusive of writing materials, training kit, provision for snacks, and certificate of participation) will be charged for each participant. 5. Send copy of bank deposit slip to NWPC’s email address (ipd.nwpc@gmail.com). 6. Kindly bring copy of your deposit slip on the actual date of learning session to get a copy of your certificate of participation. 7. Only those who paid through bank deposit shall be considered registered. 8. Registration starts at 1:00 p.m. and program commences at 1:30 p.m.
9. 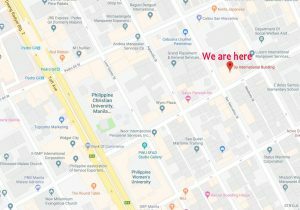 Venue is at the NWPC Conference Room, 2nd Floor Dy International Building, San Marcelino corner General Malvar Streets, Malate, Manila.